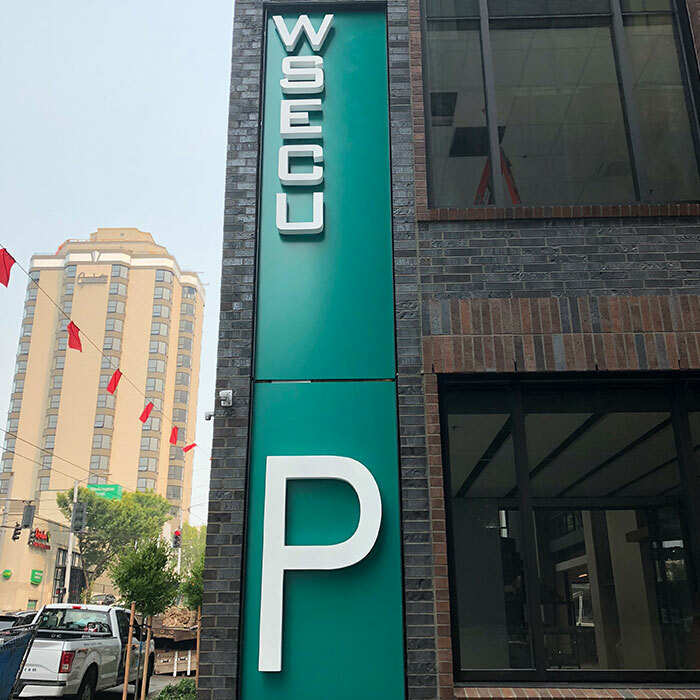 While working on the Harrison Hospital Parking Garage project in Silverdale we discovered that the general contractor working on that project was also working on a brand new WSECU location in Seattle. They were going to need a full interior and exterior sign package. After discussing the project with the crew in charge we put together a proposal and submitted it for their review and consideration. 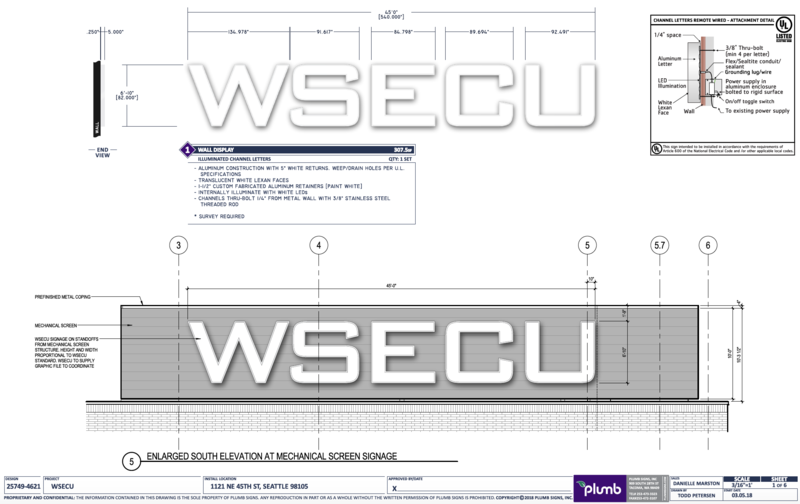 Due to our experience, pricing, proposed sign package, and familiarity with the GC and their other projects, we were awarded the job and very excited to get started! 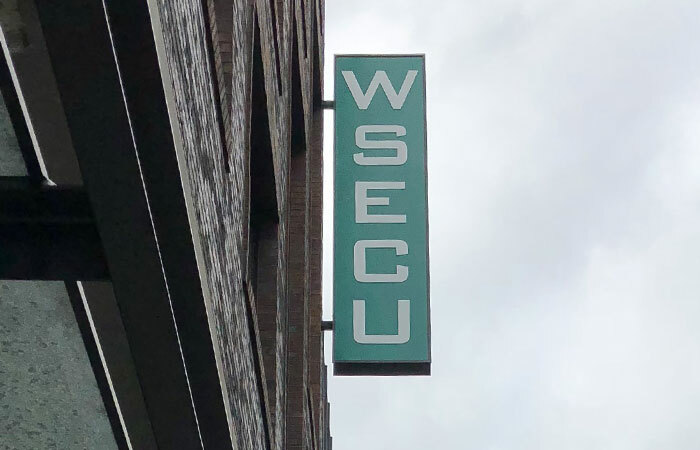 WSECU was completely on board and ready to get the ball rolling. 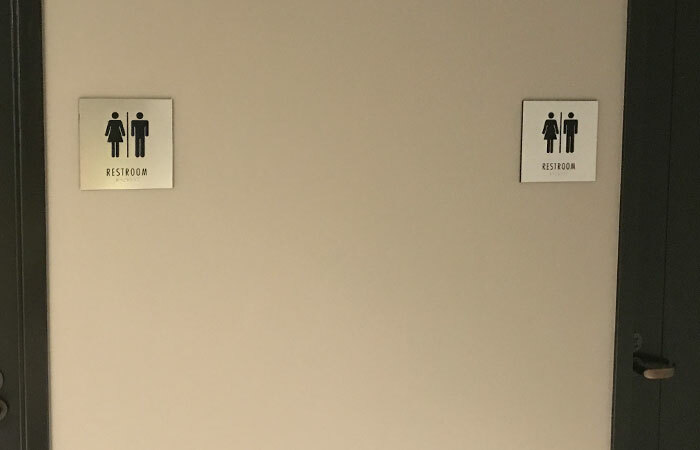 However, due to some restrictions that the city has in place for where the building is located we ran into a couple issues with the original plan. But with every challenge comes an opportunity to get creative and a chance to come up with an impressive solution. 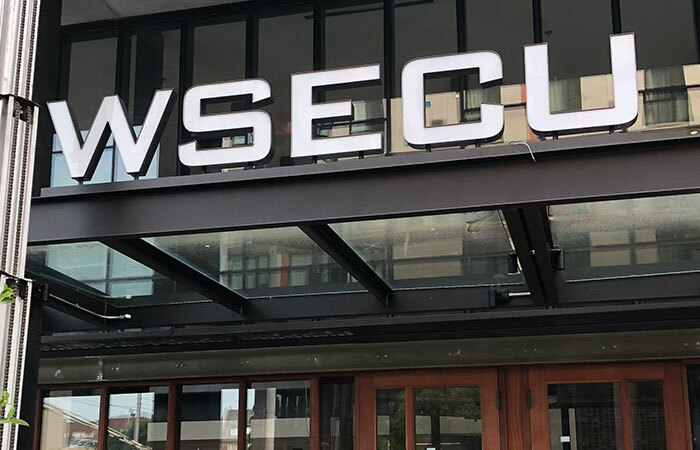 The rooftop sign was exciting and would have been effective in increasing the line of sight from a distance but the blade sign still provided some of the same perks while also creating an accessible viewpoint from the ground level. It may not have been as high as the rooftop sign but it was still up there high enough to be viewable by people walking or driving by. Outside of the revised exterior sign the only other hiccup we ran into was that once we got started there was a change in heart when it came to the canopy signs being illuminated. Originally they were non-illuminated but after some consideration it was decided it would be best to light them up. It wasn’t a big hurdle but required some additional quick thinking to adjust the plans while not delaying things and compromising the timeline we were on. 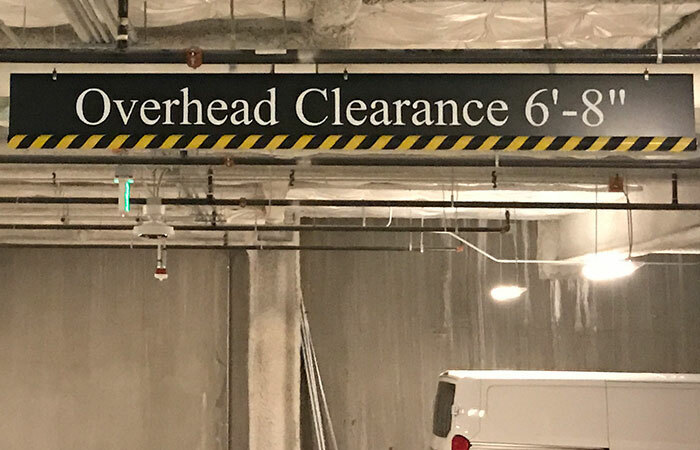 On a couple different occasions on this project we thought we were going in one direction and at a moments notice we had to shift gears and come up with an alternate solution that still checked all the boxes for the customer while also aligning with the city’s signage restrictions. 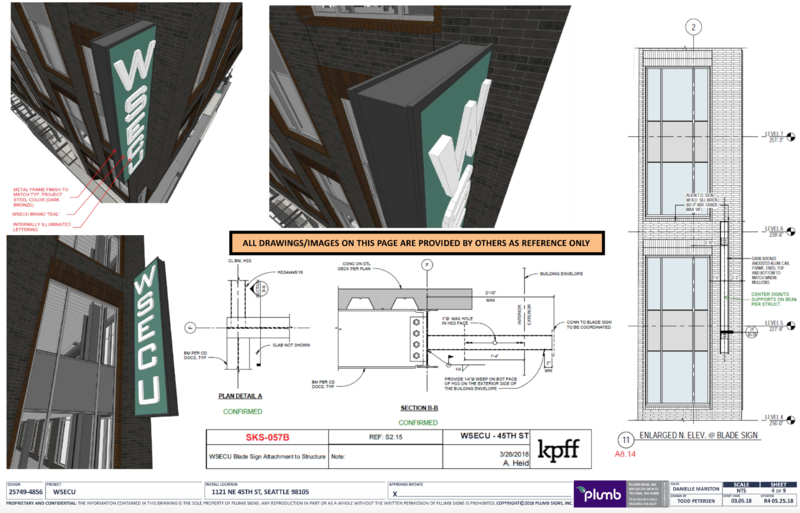 First was changing the high rise rooftop sign to an elevated blade sign on the corner of the building. This was a biggy because it was the statement piece for the entire project and could have resulted in an underwhelming experience for WSECU. 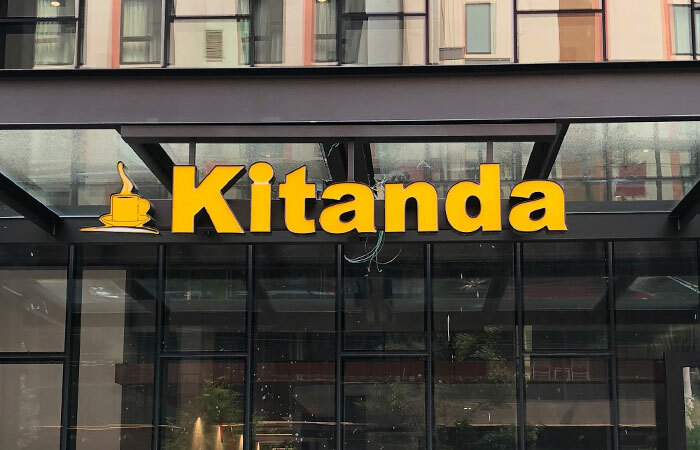 But due to our adaptability and creative thinking from the entire team involved we were able to come up with a solution that was just as effective and exciting for our customer. The other case was with the illumination of the canopy signs. 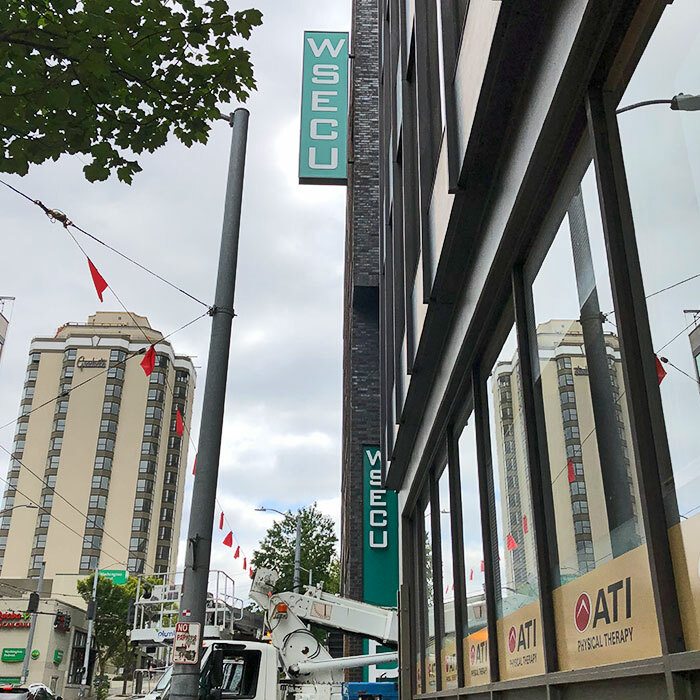 Going from non-illuminated to illuminated requires some reconfiguration of the fabrication of the sign as well as the installation given the signs would now require power. 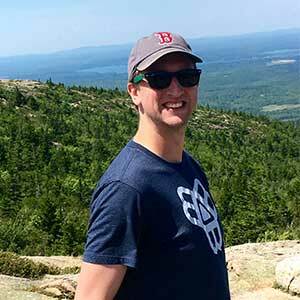 But once again, our agile and adaptable team were able to make the changes and make sure we didn’t miss a beat when it came to the installation process and powering them up. It always helps when you have a couple journeyman electricians on staff and some crew members who have been doing this for over 30 years. Although this project had a couple obstacles pop up throughout it we were able to keep a positive attitude and keep things moving forward to a successful on time completion. The result may have changed up a bit from the original plans, but we honestly feel it was a blessing in disguise and was all for the better in the end. Our crew was up to the challenge and is always eager to put their creative problem solving skills to the test. 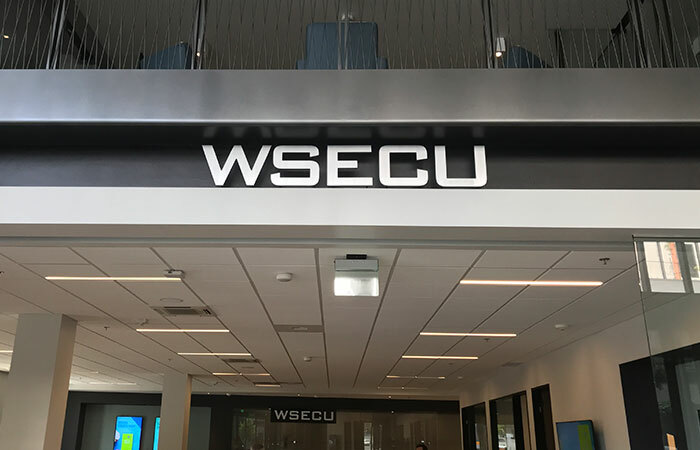 At the end of the day, WSECU ended up with an eye catching and effective sign package throughout the interior and exterior of their new building in Seattle. We can only hope that they are as excited with the final result as we are!